Elevator Repair Service, Cab Legs. Photo by Clemens Scharre. Images courtesy ERS. I never thought I’d hear an artist complain about having too much attention. Then I encountered theatrical wunderkind John Collins, co-director of the rising-star dramatic ensemble Elevator Repair Service and sound designer for the Wooster Group. He confessed that he had recently been motivated to explore a minimalist style because he had been overwhelmed by a stream of requests to create new works, as well as feeling encumbered by the number of props the group used in earlier plays. Whatever the source of the group’s inspiration was, this trajectory led them to Cab Legs (1997), an oblique homage to Tennessee Williams. Their latest unlikely project, Total Fictional Lie (1998), was generated out of this enigmatic and resourceful troupe’s investigation of documentary film as a source of unintentionally grandiloquent monologues. In April, they will revive their 1994 piece Language Instruction , which deals with the absurdity of foreign language audio cassettes and the late comedian Andy Kaufman. Despite the rhetoric about economy of gesture and weariness, ERS fills their stages with a manic energy that is carefully orchestrated, occasionally edgy, and often joyous. In seven years of performing together, the group has elaborated a collaborative process they clearly enjoy, and that yields startling results. In December, I met with Collins, co-director Steve Bodow and performer Rinne Groff in Bodow’s West Village apartment to discuss their recent projects. Coco Fusco What do you really like about live performance? John Collins How likely it is that it’s going to go wrong. How unpredictable. We like things to look like they’re going wrong. CF Your work is highly calibrated, especially in the choreographed sections where the energy comes from the ensemble’s finely orchestrated movements all in unison. Steve Bodow But we try not to make the choreography look too mechanical. It comes off as the sort of chaos you’d encounter on the street, or walking through Grand Central Station where there are 300 people and nobody runs into one another. Rinne Groff We’re interested in behavior that looks absolutely unplanned, and seems very nontheatrical, almost as if accidents are happening. But by using precision, too, we let the audience know it’s okay, that we know what we’re doing. CF I asked about live performance because of the influence—particularly in Total Fictional Lie —of film in your work. JC We involve film in our pieces because it’s so different from live performance. It gives us an opportunity to take something performed in another medium and translate it to ours. SB We like words or movement or sounds that go through a process of several translations. Sometimes it’s literal, from one language to another, sometimes it’s more metaphorical, from one medium to another. Certain things aren’t going to translate directly. What do you do when you’re translating into a language where the corresponding words don’t really exist? You have to get creative, you have to find ways to solve the problems, which is going to force you to make interpretations and make choices about them. It puts a personal stamp on whatever material you’re working with. RG Our use of film in Total Fictional Lie is different from our previous uses of the medium. Usually we watch films to get some physical vocabulary, something totally abstract. But to prepare for Total Fictional Lie , we studied long speeches. Shakespeare’s plays have monologues where actors talk directly to the audience, and somehow that works. But today monologues seem so arty or contrived; now the only things that seem sort of real are grunts and groans and unfinished sentences. And the only form in which people talk for a long time is the documentary film. JC That is the place where self-revealing speech really lives. CF The documentary form is obsessed with making ordinary people famous, as well as making weird, strange, marginal people famous. There’s a kind of freakishness to American documentaries that I thought was brought out in your piece. RG Well, Total Fictional Lie obviously has that freak-show take about it. Colleen plays a character who comes right out of that Jerry Springer mode. People come to see ERS’s work and sometimes think it’s so weird. Then I watch this real TV, and I say to myself, What we do is weird? Are you looking at this man’s face? He’s twitching, his faces don’t make sense. To me, that kind of real-life behavior is as weird as anything we do. CF I ask about your relationship to film and TV because it seems you have a very comfortable relationship with pop culture. There are those who believe that if one allows high culture to be too influenced by pop culture it will be destroyed. JC People who say that infusing theater with pop culture references or material destroys a certain kind of art are right, in a way. I’ve always thought that theater as an art form was really slow to evolve—unlike painting, for example, which, when photography came along, was completely transformed. Many times people assume that if pop culture is represented in any way that it’s being made fun of. SB We try to be very careful these days about looking for inspiration in things—like comic books, or choreography from Hollywood movies or Old Fella records—that we actually think are good, not just campy good. JC What we’re drawn to is what’s mysterious and strange in popular culture—the docudramas, the talk shows, the documentaries. CF I see a remixing strategy in the way you work that is more reminiscent of music than film. What do you think of that as a principle of how you structure things? SB As a group we talk about structuring things musically. Each element—speeches, sound cues, movements—is an instrument. If something goes wrong in a show—someone forgets a line or messes up a dance move, or if a speaker goes out of order or a sound effect gets lost—people say, I didn’t notice because it was so chaotic! There’s so much going on. My stock response is that it’s as if you’re listening to a piece of music that has a clarinet, not as the lead instrument but as something in the background. It’s going to sound a lot better with the clarinet than without it, even though you might not be able to really put your finger on why. We think about our work that way. JC We’re also drawn to talking about things musically because it’s a form no one puts literary or narrative requirements on. That’s the kind of freedom we want to have with this work. We see our theater as a form with a lot of integrity. The form we are specifically interested in and that has a lot of possibilities, including literary texts—but we don’t want to be limited to that. CF One of the other aspects I think about is sampling, which has to do with lifting material. JC We could take a single element, like a play, where you start at the beginning and finish at the end and don’t include any other structure except what’s in that script. Another alternative would be for us to write our own scripts and not let external information in. Our method of creating is about making cumulative reactions, taking things and seeing what their combination yields. It’s important that what we are working with is foreign to us, strange. I’m most comfortable creating out of the unfamiliar. I’m not comfortable using personal, biographical information. Elevator Repair Service, Total Fictional Lie. Photo by Jay Collins. CF You say foreign; how foreign is your material? What is it that makes it foreign to you? Is it that it’s not directly related to your life, or because it seems odd in some way? JC Sometimes these stories, texts, characters, props, found materials … are related directly to our lives. People will bring in ideas they do know a lot about. But our collective process is about looking at those things we’re not familiar with. For example, in Language Instruction , which we did several years ago, we were initially working with these strange Berlitz-type language books. Then, for no reason other than it was on his mind, Steve brought us Andy Kaufman as a topic. We did more research. Some of it was directly related to Kaufman’s biography, but other stuff came from what emerged as a weird coincidence where one of Kaufman’s characters was this “foreign man” who couldn’t quite get English right. The combination that came out of that was neither Berlitz nor Andy, but some third thing. That’s what we try for. CF A lot of what is written about you deals with humor, or the things that strike you as funny when you’re working together in rehearsal. JC It’s related to the fact that we work in an ensemble; humor is a social thing, it’s a big part of the way we relate to each other as friends. Making theater is a solid way for us to connect and react together on something. RG What I like about performing with ERS is the feeling that whatever is happening between us on that stage is so much more loaded and funny for us than it could possibly be to any other human being in the world, because we’ve been there through the whole process of watching it being created and working on it. I used to crack up on stage. I’ve gotten better about it. (laughter) So that when you’re in a scene with somebody, you have the shared experience of having created this thing. Humor often comes out of that, too. JC Coco, wait. All of those things you just said apply in some way to humor. CF But the results were much different. RG When we performed in Amsterdam recently I went to visit a couple of my parents’ friends who live there and who were with the Living Theatre. They showed me books about their group, and there they were in Algeria, living out of a van, harassed by the police. I just felt so stupid. We were complaining about per diem and who got muffins at their hotel. They believed in changing the world. CF But they also believed in changing themselves, fundamentally. JC Ensembles work because they have some kind of common interest. One of the things we share most closely is a sense of humor. I don’t think that means that our group has any less weight, or purpose. CF There are plenty of theorists who will say that humor is a way of opening people up and making them more willing to expose themselves to different ideas. It can be very radical in that way, it can be very subversive. But other people will say: If you’re so focused on humor then you’re not dealing with the bigger problems of life, drama, theater, performance, et cetera. JC Whatever we’re doing, we always want it to feel like there’s something underneath it. When something feels funny in an easy way, it’s a sure sign that we’re not doing enough, we need to be saying more. So we’ll look for a way to undercut it or give the impression that there’s more to it; that describes our sense of humor. We’re always saying we want people to laugh, but don’t want them to know why they’re laughing. We like a kind of humor that suggests something crazy and complicated and mysterious. Elevator Repair Service, Cab Legs. Photo by Clemens Scharre. CF Another thing that seems to hold the performers together is the dancing, the movement in your pieces. There is something strangely joyous about moving together. It looks like you have a lot of fun dancing with each other. RG Dance is coming into our work more and more, and that brings so much joyous energy to it. SB Dance is also a good way of getting directly at that musicality we were talking about. It’s a chance for us to focus exclusively on the musical composition of a non-musical element of the show. CF How do you work? Where do you start? JC Sometimes we’ll start with ideas that evolve and fall away. Our process for large-scale projects, in terms of early ideas and finished pieces, is very similar to how we work on a small scale. We try to give ourselves enough structure to start working, but we’re also looking to discover material through free association or accident. CF How did Cab Legs start? SB Cab Legs started out as a show about the fire department, which ended up not having any place in the final product. RG We were interested in the idea of waiting. Firemen sit in a firehouse waiting for something to happen. JC Waiting for their job to suddenly call them. RG People brought in these heartrending narratives about people in fires that were just crazy stories about people losing their homes. This was when the TWA plane blew up, so we talked a lot about tragedies. JC We thought of creating a piece by doing as little as possible: Let’s see what will come of people just sitting on stage doing absolutely nothing. CF Yes. So what do you do in rehearsal? RG Basic task-oriented kinds of things. We might start by saying, Okay, let’s make a dance of this man’s hand gestures. Or for Total Fictional Lie , we had this box, a little bit of text from a Nick Broomfield documentary and someone said, “You two get in the box and say the text.” And Blake, our sound designer, was playing around with effects. So we would cull a couple of sounds, and then tried to make a dance or a scene. CF Do you find the music first, or do the dances come first? SB We usually get a couple moves together and then find some music, or maybe we have some music in mind but we don’t know what dancing is going to go with it. JC Usually, music is at least around in the beginning. We get frustrated when we go for too long without knowing what the music is going to be. We like music to be there, although sometimes we’ll change the music. It’s very fluid. Somebody wrote us a letter about the dances. She was referring to Cab Legs and she said that there was all this difficulty with the people onstage communicating, this extreme awkwardness in trying to say things and relate, so that eventually it seemed like the characters would just give up and dance. Dance was a solution to the problems we were working through in speech and conventional performing. We also use it as an energy release, a counterpoint to other things we’re interested in aesthetically, a very real human awkwardness put on stage. SB A bit of progress we made in Total Fictional Lie happened with a thing called Foot-Dance . Where, downstage, there’s a bunch of sitting people dancing with just their feet, while upstage behind a suspended wall two people are having an argument, so you can really only see their feet and hear their voices. Gradually, the dancers on stage get interested in what’s happening behind the wall—but they don’t interrupt their tiny foot moves. In the past we’ve mixed scenes and dances, but in TFL we found a way to have them happening on top of one another—really responding to one another. The simultaneity was dynamic. I thought that was an interesting direction to take things. RG The gestures in the foot dance themselves are so humble and awful: a kick with the foot, someone crossing their legs. It’s not beautiful, it’s not the kind of thing you’d expect a dance number to be and yet it’s orchestrated so meticulously that it has precision to it. We try to make our feet twist a little bit this way, which with my foot can’t happen, and the choreographer would say, “Pull your foot up and then twist it, do it manually.” All these kinds of things are so lame on a certain level, and we all love them for that reason. That dance is based on a speech in Errol Morris’s Vernon, Florida , in which a guy is describing a turkey hunt. It’s just a shot of him, from the waist up, talking. He’s gesturing with his hands, his fingers splayed, and we try to copy that hand gesture with our feet. It’s the awkwardness again—you can’t do that with your foot. CF Nobody could talk to each other in Cab Legs . And in Total Fictional Lie , people didn’t talk to each other much either. Is there a running commentary in your work about the impossibility of certain kinds of communication? SB Entirely paraphrased. Fresh each night. SB The actors had line meanings but not lines. SB It was fairly tightly structured improv, but even the fact that you’re going into it not knowing exactly what you’re going to say changes the delivery, no matter how fine an improviser you might be. JC That’s another reason we’re interested in drawing from film and video, because it gives us formal ideas for tasks we assign ourselves that are impossible to complete or do accurately. Whether the task is to make complicated hand gestures with your feet while sitting down, or to recreate a film edit—I mean, there is a dance in Language Instruction that’s all about us trying to recreate this fast edit, a jump cut, from the film of The Great Gatsby , which can’t be done. There’s no such thing onstage. If on film you see one person facing this way, and then in the next frame, someone facing that way—live, onstage, we’ll have to include the turn. Just to recreate this film thing, onstage, forces us to make a move, to create a move, which is the jump, the turn. CF What did you think of Michael Feingold’s observation of Total Fictional Lie —that only women were in the box? JC (laughter) I wanted to get in the box and brainstorm. RG We try not to comment too much on anything. But I think we are aware of gender issues. In the end, we try not to be made so heavy by those things. JC We don’t want to be making things happen in a calculated or intellectual way. We let the show physically evolve in front of us in rehearsal through the tasks we’ve given ourselves. SB It’s an organic evolution having to do with who each of these characters are and what we’re physically trying to accomplish in the show. We won’t change what we’re doing for an intellectual reason if we’re doing it for these more organic reasons. JC There have been times when we realized we were accidentally saying something we didn’t want to be saying. We have probably edited ourselves in minor ways—we’ll shift something a little bit. Elevator Repair Service, Total Fictional Lie. Photo by Dona Ann McAdams. CF In an artistic statement, you said something about working with just the space you’re in. I’m wondering how much of the decision to be as low-tech as you are is a pragmatic decision, and how much of it is an aesthetic decision. SB In the early shows, when we really didn’t have money, the light board was built out of household rheostats and half of the stage lighting was fluorescent desk lamps. It’s hard to say whether that was absolutely an aesthetic or a practical choice—but we liked it. It seemed honest. CF There are, of course, theoretical arguments about the use or non-use of sets. There’s the Brechtian argument that sets are distracting and illusory, so that when you take them away, audiences are forced to deal with the reality of their own situation. There’s the Grotowski argument about how theater is ultimately just about the performer. JC We have a weird, dual relationship to that idea of Brecht’s. My guess is that he’s talking about simplifying, stripping down and making things real because that’s the best way to get your message across, the best way to speak your idea to the audience. We share the notion that too much laid on and too much decoration can distract you, but it’s the mystery and electricity of a bare space that appeals to us. CF Can you talk about work that you like and don’t like? SB I pay more attention to music than theater. I don’t have a background as a theater person. I go to more theater now than I used to, certainly. Lately, I’ve been going to more dance than ever before. But I know most about music. CF So what about music? SB I’ve been listening to early ’70s Miles Davis stuff … Polly Harvey—P. J. Harvey—is an actual, bonafide artist working in pop music these days. And, I’m listening to ’30s Ellington and some old folk music. SB Does that say anything about the theater we do? I listen to a lot of music, it’s what I like to do. SB No, no, if that’s what it sounded like, I was being disingenuous, because I go to theater and I look at it, I just don’t feel like it’s my primary competency. I know a lot more about music than I do about theater. JC In college I was influenced a lot by going to Wooster Group shows, and I probably unconsciously imitated them. Now I have a completely different relationship with them, since I’ve been working for them for five years. But what influenced me the most about the Wooster Group was not so much their work itself, or what I saw in it. It was more about the way they worked and the kind of freedom they had. They make their work without any idea about what theater should be, without any preconceptions, except that it should be enjoyable to watch. I might say the same thing about Richard Foreman. They’re completely trusting their own instincts. CF I never thought the Wooster Group as producing crowd-pleasers. I always thought of it as very serious, intellectual, hard. JC The very first time I saw them, I was baffled. It was the show of theirs with maybe the greatest density of text and media. CF What did you see first? JC Frank Dell’s The Temptation of Saint Anthony . At 18, I hadn’t ever seen anything like that before and I didn’t even know how to think about it. But the Wooster Group administrator, speaking to the school group that I’d come to the show with, simply suggested that we look at the piece as though it were visual art or sculpture. It was as though he were saying, “Don’t lay all those conventional theatrical expectations on it, because they’ll just get confused.” And that blew my mind wide open. 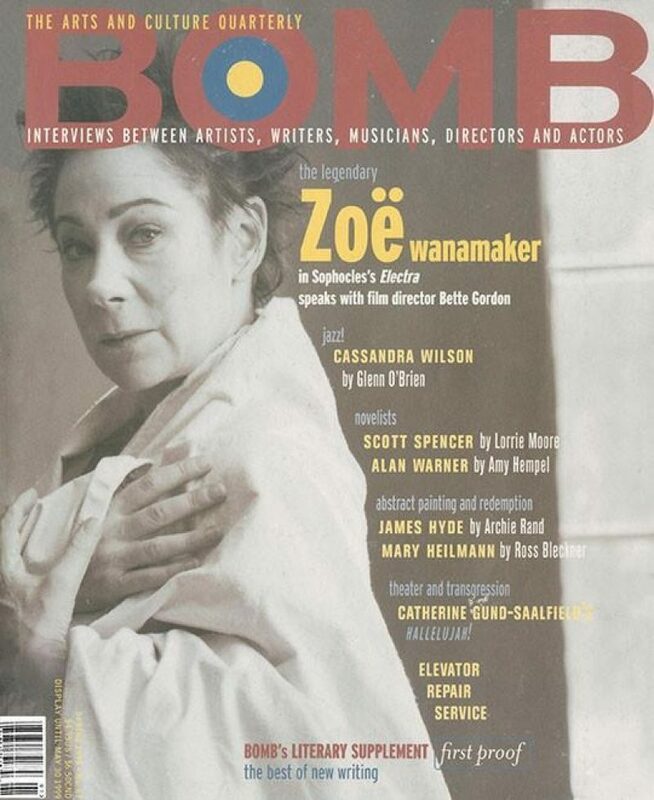 Featuring interviews with James Hyde, Mary Heilmann, Alan Warner, Scott Spencer, Catherine Gund-Saalfield, Cassandra Wilson, Revenge Effect, Elevator Repair Service, Zoe Wanamaker, and A Day in Brasilia.